Using both the truck and the Tahoe, we only needed one visit to Clark's storage pod (we're keeping the pod business in the black) to get all of his stored items and then went back to his dorm room to spend the day unpacking and putting things away. Another lunch at Blue Sky: Mike's BBQ with coleslaw on focaccia which is worth the 1000 mile drive! A meeting with Tom Beebe (hopeful builder of the new house).... no numbers for us regarding the possible cost of building the new house, so that was disappointing. We fired the first salvo in the Great Cedar War by spending an afternoon cutting down cedars in the section of field down by the church. We had brought gloves, the big chainsaw and the "chainsaw-on-a-stick" along to Virginia so were prepared for battle. In the photo below, the left side of the field is untouched and the right side is post cedar eradication! We'll let it grow up in woods, but I'd rather have pines and hardwoods and not a cedar thicket. I have a feeling that this will be a battle we'll be fighting for about 10 years! In an effort to try something new whenever we're in town, we went to Wood's Creek Grocery for the first time for lunch.....we'll be back! The Community Festival on Saturday had Main Street blocked off and five blocks of tents set up. In addition to food, crafts (a bit of a letdown there) and giant inflatables for the kids, every civic group from the SPCA to Master Gardeners was represented. I can't wait to get involved when we move to town. But the real reason for the visit was to help/watch Clark move into his dorm room..... our first RA and our last college move-in! I love you Clark! In response to Asher's request, I spent the last hour trying to figure out how to do a site feed that would let you get email updates if I post something new. My brain hurts, but in the top right hand section there is now a link to subscribe via email. If there is a new post, you'll get an email.... no post, no email. So your inbox won't be clogged with daily things that say "nothing new." 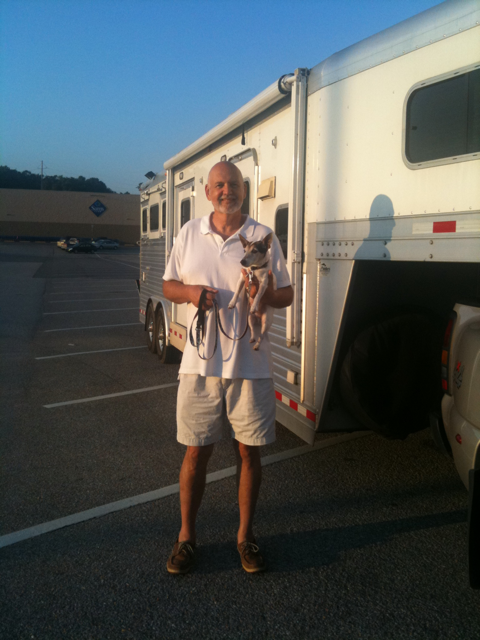 After overnighting in the Camping World parking lot until opening time, we spent the morning looking at RV's and shopping while we waited for the service department to give the verdict on our AC problem. Unfortunately it was bad news and we needed a new compressor. After 3.5 hours and a spending a "little" money, we had a new one and were finally on our way! We pulled into Lexington at lunchtime and parked the truck and trailer in the freshman parking lot at the rear of campus. Clark met us and we walked through campus to town and over to Blue Sky Bakery for lunch. The weather was perfect and we had finally made it to town! Then it was back to the truck and trailer and off to the storage pod to unload. Three days ago after a full day of loading things into the trailer for the trip up, we were absolutely exhausted. Between the heat and the heavy lifting, I honestly can't remember when I've ever been so physically spent. But with Clark's help and not having to haul things through the house and out the driveway in the 98 degree Louisiana humidity, unloading was relatively quick and easy. Among the things on this trip: the nursery rocker (how could I let that go?) and also the Narnia lamp! The top is packed in a box.... How could I leave my lamp behind in the woods? It will be even more at home deep in the woods on Elliot's Hill! Then it was off to the dorm room where we dropped off the carpet remnant for Clark's room, got that laid out, rearranged and rebuilt/lofted dorm room furniture and called it quits. Campus police gave us the okay to stay overnight in the freshman lot. We were thankful that we didn't have to move after such a long day and also glad to be within walking distance of everything in town. After cleaning up, it was off to a relaxing dinner out on the upper porch of Macado's.... what a wonderful town!! 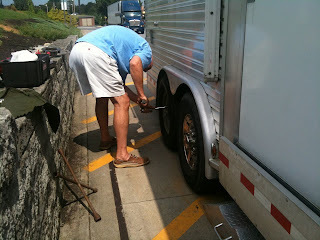 We had the blowout only one mile from an exit and we limped into a Pilot truck stop in Dandridge TN. Though perhaps not quite as experienced with trailer blowout changing as four certain handsome young men, Joe was up to the task. I wasn't much help and mostly stayed inside calling around to try and find new tires. The new tire ramp/cradle worked amazingly better than the teetery pile of boards we had to use on Big Trips. Only 1 mile farther down the side road was the Jefferson County Farm Co-op which had two tires in our size. We bought them both! Had them mounted, then put the spare back and were on our way. We're still not in Lexington though! At the co-op, we realized that the AC in the trailer had gone out. It worked fine last night and blows but doesn't cool. So we're overnighting at the Camping World in Roanoke where the service manager said that he'd fit us in at 8am when they open. It's mid 60's, so we're comfortable without AC. Other than the fact that we're rapidly getting poorer on this trip, we're having a fine time! Remember when his head was black with rust eyebrows? Obviously I'm bored... About to pull over so that I can take a turn driving. Only the finest overnight accommodations in Tuscaloosa for us! Not just a Walmart parking lot but a dual lot with Sam's! Since we didn't leave until 5pm, we didn't get far. But it beats doing the whole drive in one day. Clark left Louisiana yesterday from N.O. and got to Lexington at 11pm so we are bringing up the rear! It's midnight and I'm tired but couldn't resist a test post via my phone. On our way to Virginia to help Clark move into the dorm and to bring another load of things to the pod. I have a feeling that we should have ditched almost everything we are moving so far.......If we can go 18 months without it, do we really need it? Two days ago, I finally got around to filtering the Limoncello. Two big pickle sized jars that have been steeping for months longer than required in the pantry. It took hours to filter but in the end was beautifully clear with no sediment at all. Half the haul goes to Paige, but my half is now in the freezer ready for a nightcap. It's delicious, but a little goes a long way! and eventually, he got it down.... the weathervane that I had made for his wedding gift. I suppose it was a leap of faith to give this as a gift since we were going to be renting a house in Baton Rouge and were years away from having a place of our own. But we knew that we wanted the country life and so it was as much a symbol of what we were hoping to have one day. It was atop the old barn made of doors at the "old house" on Hwy 61, then atop the barn here in Port Hudson and about 8 years ago we moved it to the newly built garden shed. Now its time to make a trip out of state to Virginia! It was made by Georgia Gerber who was a fellow student at Bucknell. She was an art/sculpture student a year ahead of us and so had already graduated but was still working in Lewisburg when I asked her about making a weathervane for Joe way back in 1978. On one of the "Big Trips", I was thrilled to see a work of hers on display at Mount St. Helens. At the time that was the first I knew that she was still sculpting. There was really no way to find out more but just now thanks to the wonders of Google, I found her website. Take a minute to click the link and go to her "Public Works" section. She has achieved a level of excellence that is awe inspiring. Her gardens and studio on Whidbey Island are as beautiful as her sculptures and since I see now that I could never afford another commission by her, I'll cherish our rooster all the more! Funny that on the same trip where the boys and I saw her Mt St Helens work, I didn't realize that we had already seen another of her creations: Rachel the Pig at Pike Place Market in Seattle! After looking at her links to her public works on the website, I realize that I've seen several others too. I wonder if she'd get a kick out of seeing our weather vane which would have been one of her earliest commissions! Anyway, the weathervane is down and waiting to be packed in a box to go along in the next load to Virginia. The timing was almost perfect since the day before taking the down the weathervane, Joe brought home flowers and we celebrated our 32nd anniversary. Hopefully the rooster won't have to live too long in the pod before he's out on a rooftop again! Last month we made the drive to Virginia with the big trailer in tow and our first load of things we can/can't live without. Extra shovels, pots, Legos, the red rocking horse, 14 pink flamingoes, Coleman lanterns, bird feeders.... an entire load of things that we won't need in a rental..... Things we won't want to unpack until we're ready to clutter up the new house! Here is our helpful assistant who rode up with us and patiently endured sharing the backseat of the truck with Atta and Mr. Biggs. Good thing we didn't have many breakable things as 900 miles of rough roads had everything helterskelter by the time we arrived. Luckily it was cool and overcast so we weren't miserable unloading and got things nice and neat. Is there really "News from the Hill"? "News from the Hill" is probably that the gigantic whitetail deer (they are the size of Welsh ponies) are grazing and the rabbits and squirrels are getting fat and happy. Until someone decides that they want to buy our house here in Louisiana, I'll actually be posting "News from Zachary" which though accurate isn't nearly as quaint and catchy a title and one that I wasn't going to invest in with GoDaddy. I debated for way too long about whether to make this a private or public blog: a journal that only I knew about or an ongoing letter open to the "boys" and other family and friends. My hesitation about sharing was based largely on wondering whether I could be true to my emotions and not be hampered by a reluctance to push the Publish Post button because I was worried about your reactions. I think I can get past that; I hope I can get past that. Obviously I'm still worried about it. Weighting the scales in the other direction, my motivation to give out the address of the blog is because although I have the best of intentions of writing and although hundreds of notes, letters and emails are composed in my brain, very few of them actually get sent. Also I'm guilty of telling 3 of the 4 sons about something and then weeks later the one I forgot says in an exasperated tone "You never told ME that....." and then in the "You Can't Win for Losing" category, I'll tell one of the Handsome Four something twice and he'll let out a sigh which simultaneously implies boredom as well as concern about my mental acuity and I'll hear "You've told me about that twice already." I'll probably embarrass both myself and some of you more than once. Forgive me in advance. After rereading this, I see that I've just written a Mission Statement and not a speck of news for my first blog post.... I'll have to work on the entertainment factor in Post Two.